Economics retained its position as the most popular concentration at the College this fall, with 671 undergraduates—a slight increase from last year, according to Dean of Undergraduate Education Jay M. Harris. Computer Science, meanwhile, continued its meteoric growth, increasing its rolls from 363 in 2016 to 500 in 2017—In 2008, the discipline had only 86 concentrators. The popularity of Economics and Computer Science aligns with the annual competition between the two departments for the most undergraduate students among the introductory courses in the two disciplines, Economics 10a: “Principles of Economics” and Computer Science 50: “Introduction to Computer Science I”. This year, Economics 10a slightly edged out Computer Science with 627 undergraduates compared to 606 undergraduates in CS50. Members of the Class of 2020 were required to formally submit their concentrations by Nov. 9. Government ranked as the third largest concentration with 367 College students in a rebound from its years of shrinkage. 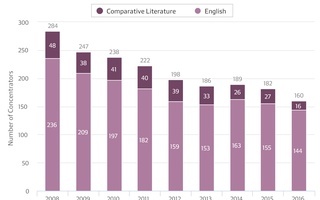 The concentration has faced a steady decline in concentrators over much of the past decade. 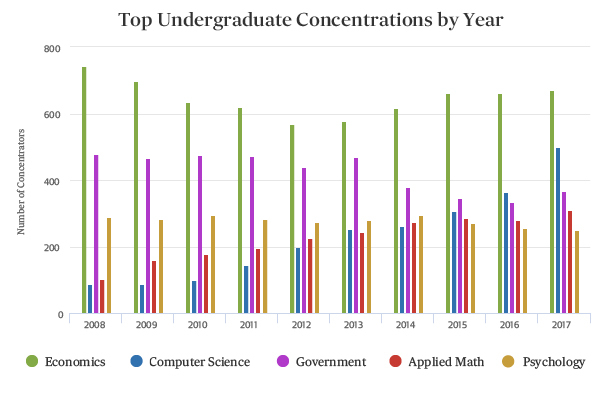 Applied Mathematics, the fourth most popular concentration, continued its growth as well, drawing 310 students compared to its 279 concentrators in 2016. Rounding out the top five concentrations is Psychology with 250 concentrators, a small decrease from 255 in 2016. Theater, Dance and Media—the College’s newest concentration—has seen increased popularity in its three-year existence. The concentration emerged as an option for the Class of 2018 with an initial class of 12 concentrators. This year, 34 students are concentrators in Theater, Dance, and Media. Although the deadline to declare a concentration already passed, Harris said that there may have been sophomores who failed to submit a petition in order to join a concentration. —Staff writer Edith M. Herwitz can be reached at edith.herwitz@thecrimson.com. Follow her on Twitter @edith_herwitz.